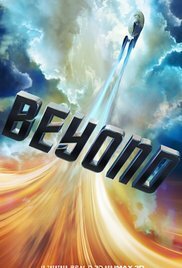 Star Trek Beyond is the third installment in the rebooted franchise and lets just say it lived up to being a positive sequel. Not only did J.J. Abrams let another person take the director's chair, that person did a marvelous job. Justin Lin is known for his Fast and Furious movies and one friend was skeptical fearing it would be something like cars racing but we were both surprised on how well the film came out. We follow the same crew; Captain James T. Kirk (Chris Pine), Commander Spock (Zachary Quinto), Doctor McCoy (Karl Urban), Lieutenant Uhura (Zoe Saldana), Montgomery "Scotty" Scott (Simon Pegg), Sulu (John Cho), and Chekov (Anton Yelchin). This time around they stop at a new Federation colony built in space and a lone ship asks for help to rescue its crew from a planet who took them hostage. This is when we meet the new antagonist of the film named Krall (Idris Elba) who has major beef against the Federation and will stop at nothing to destroy everything the Federation has done in the universe. He certainly has his reasons, though. The Enterprise is utterly destroyed by Krall's power and aside from the Captain Kirk and a few other crew mates the ship crash lands on the planet and the rest of the crew are taken hostage. Kirk realizes this was all a trap and with the help of a planet native by the name of Jaylah (Sofia Boutella) he must save his crew and stop Krall. The plot of Star Trek Beyond is the same as the last two movies: there is always that one person who wants to take over the universe and James and the Enterprise have to save the day. Even so, Justin Lin did an amazing job. I left Star Trek Beyond in awe of the music, the musical score, the visuals themselves and how great the cast performed and the story behind it all. J.J. is busy doing Star Wars but he left Star Trek in good hands. If you are a lover of this series or genre I'm sure you won't leave disappointed.